Baby Yoshis are newborn Yoshis born from Yoshi Eggs, making their debut appearance in Super Mario World. Unlike their adult counterparts, Baby Yoshis' mouths appear to resemble beaks, an apparent nod to Yoshi's more reptilian prototypical design. In Super Mario World, red, yellow, and blue Baby Yoshis are only found in Star World, where they hatch from eggs of the same color whenever Mario makes his approach. Feeding the Baby Yoshis five enemies will make them turn into adult Yoshi; however, if a baby Yoshi eats any power-up, it will grow up instantly. Also, all the eggs Mario rescues from the Koopalings hatch into Baby Yoshis during the ending cutscene. Yoshi himself hatches directly into an adult when Mario uncovers his egg, but this is because Bowser trapped Yoshi in the egg. Unlike their adult counterparts, Baby Yoshis can't use their tongues to eat objects. It only eats anything that it makes contact with it like when Yoshi eats a berry. In the Game Boy Advance remake Super Mario World: Super Mario Advance 2, once a Baby Yoshi is found in Star World, it is possible to find their colorations in lieu of Green Yoshi inside any ? Block containing a Yoshi Egg. However, these Yoshis will not remain as babies. Instead, they will grow straight into adults like Green Yoshi. Mario's present form will determine what color Yoshi Egg will come out of the ? Block upon hitting it. In a 2017 interview, it was revealed that Baby Yoshis originally had a blob-like appearance. Blue Toad with a Bubble Baby Yoshi and a Goomba trapped in a bubble in New Super Mario Bros. U. After a long absence, Baby Yoshis return in New Super Mario Bros. U and in its Nintendo Switch port and New Super Luigi U. They now sound as they do in Super Mario World but high pitched. They are found in color swapped Yoshi Eggs. Like in Super Mario World, they can eat enemies—however, unlike in that game, they will not grow, instead remaining as babies. There are three different colored Baby Yoshis: Bubble Baby Yoshis, which shoot bubbles used to defeat enemies and earn three coins; Glowing Baby Yoshis, which illuminate dark areas and stun enemies; and Balloon Baby Yoshis, which inflate like a balloon for vertical movement. Baby Yoshis in this game run away like their adult counterpart if a player carries one while coming in contact with an enemy (if hit in the back). Like in Super Mario World, if the Baby Yoshi comes in contact with certain enemies, it will eat it. Unlike their adult counterparts, Baby Yoshis (minus Glowing Baby Yoshis) follow the player into the End-of-Level Fortress. Baby Yoshis periodically appear on the World Map, and can be picked up and used in levels that normally do not have Baby Yoshis (minus Castle, Tower, and Airship stages). Baby Yoshis can be kept until the player loses them; if there are multiple players, all players can continue to use Baby Yoshis as long as one player finishes the level with one. While swimming with Baby Yoshis, the player's swimming style resembles that of one who bears the Frog Suit or Penguin Suit, and the Baby Yoshi's normal abilities are replaced by an underwater spin maneuver that gives the player a speed boost. Baby Yoshis can't eat berries. Baby Yoshis also vocalize to the music when picked up. Baby Yoshis are also key factors in red Toad House minigames. In this minigame, they swallow icons that give the player a chance to win or lose the minigame. Balloon Baby Yoshis have the item icons which determine what power-up the player obtains, Bubble Baby Yoshis hold multiplier icons that determine how many power-ups the player obtains, and Glowing Baby Yoshis hold a Toad icon or a Bowser icon. The former allows the player to get the power-up, and the latter automatically marks a loss. The player must fit the Baby Yoshis in their respective color spots. Yoshi as an infant in the Super Mario World television series. 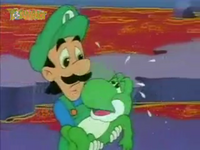 Baby Yoshi is the young version of Yoshi in the Super Mario World television series episode "Mama Luigi". He differs from the Baby Yoshis from the Super Mario World game, Baby Yoshi is shown to be able to move on his own and use his tongue as a baby, is able to eat many enemies without growing, and does not possess any shoes on his feet either. He knows how to talk right from birth, but mistakes the first person he sees, Luigi, for his mother. A Yellow Baby Yoshi known as Little Yoshi appears in the game Tetris Attack. He appears to be Yoshi's friend, although their relationship is not clarified. Little Yoshis appear in the game Yoshi and can be seen on the title screen. A Little Yoshi will appear if the player sandwiches two egg shells together with no enemies, or at least one enemy on the NES version, rewarding the player 50 points. The eight Baby Yoshis from Yoshi's Story, along with Poochy. A green Baby Yoshi from Yoshi's Story. In Yoshi's Story, eight Baby Yoshis are playable. However, they look different from their Super Mario World counterparts, and instead look similar to the appearance of adult Yoshis, and act like adult Yoshis, as they have most of the abilities an adult Yoshi would have, such as the Flutter Jump, Ground Pound, the ability to stick out their tongue to eat Fruits and enemies, and the ability to lay eggs. Additionally, during the story sequences at the beginning and ending of the game, they were shown to have smaller and less developed bodies in contrast to the Yoshis seen only on the very first page in the intro. A green Baby Yoshi hatches from a Yoshi Egg. A green Baby Yoshi makes an appearance in Yoshi's Island DS. 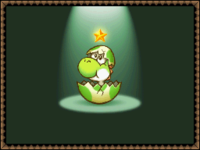 After the six original star children are shown during the credits, a Baby Yoshi hatches as the seventh star child. Much like Yoshi's Story, he looks like an adult Yoshi. Green Baby Yoshis are used as a stamp for the Art Mode and an instrument for the music mode in Mario Paint. Their sprites are reused from Super Mario World. Their sound effect in music mode is the same sound effect as the Yoshi sound effect from Super Mario World. In Super Mario RPG: Legend of the Seven Stars, a pudgy Baby Yoshi appears as an inhabitant of Yo'ster Isle; Mario can feed this Baby Yoshi Yoshi Cookies. In Paper Mario, Baby Yoshis are known as Yoshi Kids and are specifically a group calling themselves the Fearsome 5. When they were first encountered on Lavalava Island, they were being watched over by Sushie, though they were thinking up plans of their own. When Mario later returned to the village after he discovers that the path to Mt. Lavalava is inaccessible, the older Yoshis are going berserk over the Yoshi Kids' sudden disappearances. Mario helped Sushie down from the tree that they trapped her in and found all five Yoshi Kids. A Baby Yoshi appear in Paper Mario: The Thousand-Year Door as well, joining Mario's party after hatching out of an egg he had previously obtained. While in the English version he is referred to as a "Yoshi", the Italian version more specifically refers to him as a "Miniyoshi", further explaining that Miniyoshis are "Yoshis just hatched from the eggs" (His Japanese name is チビヨッシー, which is the Japanese term for Baby Yoshi). Despite being a newborn Yoshi, he is already able to talk, to lay eggs (with his Mini-Egg move), to carry Mario on his back and to flutter while carrying him. He is, however, able to jump only without Mario on his back, as seen in his Ground Pound move. Baby Yoshis have made frequent appearances in the Game & Watch Gallery series. In Game & Watch Gallery 2, Little Yoshis appear in two games. In Parachute, they appear as parachutists who, unlike the Toads, can heavily vary in descent speed. In Chef, Princess Peach has to feed Yoshi, but if she feeds him overcooked food, he will revert into a Little Yoshi. If she feeds Yoshi enough cooked food, though, he will release an egg, which contains a Little Yoshi. In Game & Watch Gallery 3 in Egg, if the Yoshi eats enough cookies, it will lay an egg, which will eventually hatch into a Baby Yoshi. The Baby Yoshi assists the Yoshi by temporarily eating cookies at a random angle. A Baby Yoshi also appears during the credits, from an egg thrown by an adult Yoshi. In Game & Watch Gallery 4, the Baby Yoshi reprises its roles in Fire and Chef. In the Toad's Rec Room minigame Puzzle Hustle one of the puzzles is a sprite of Mario holding a Baby Yoshi from Super Mario World. Six baby Yoshis are the main characters in volumes 19 and 20 of the CoroCoro Comics manga Super Mario-Kun, which cover the events of Yoshi's Story. They each have unique personalities and appearances, and accompany Mario and Poochy on a quest to retrieve the Super Happy Tree from the clutches of Baby Bowser. Throughout the story they are referred to as T.C.Y., or "Team Chibi Yoshi." Each of them has a page dedicated to their introduction with a four-panel comic that displays an outstanding aspect of their personality. Volume 19 of Super Mario-Kun. Volume 20 of Super Mario-Kun. For this subject's image gallery, see Gallery:Baby Yoshi. ↑ Yoshi instruction booklet, page 14 on NES and page 13 on Game Boy. ↑ 7.0 7.1 kaomoji7952 (July 12, 2009). ペーパーマリオＲＰＧ 縛りプレイpart38. YouTube. Retrieved October 4, 2015. ↑ Game & Watch Gallery 2 instruction booklet, page 21. This page was last edited on April 1, 2019, at 17:26.